I have six 6 of these magazines. They always work. This is one part of your 1911 you never have to worry about. The design and function of these magazines is flawless. Another winner by Wilson Combat! Had to exchange magazine spring & follower kits for magazines. Wilson did it without problems or delay and they are as courteious as anyone can be. They REALLY TRY to help you and they are great to work with. I own several brands and this is by far the best one to date! it feeds perfectly they have yet to act up i have dropped then in the dirt and it has never failed me i would never go back to Chip WC for life. I have eight Wilson magazines for my .45s. They had never given me any problems through thousands of rounds. Then, two of the mags became difficult to insert into my Caspian frame. The feed lips had begun to spread. I contacted Wllson and they had me send them back. Two weeks later I received 2 new the mags free of charge. A good product with a great warranty! Stop Reading. Go buy this right now. Several of them. Im running these in my Sig 1911. I actually thought the magazines that came with the Sig were pretty good quality...until this came in the mail. It is night and day difference. These are MUCH easier to load, yet somehow feels more stiff and solid when pushing rounds out. The magazine must be a fraction of a bit narrower as it loads into the gun much smoother and engages much more positively. I have been and still am critical of the Wilson 9MM ETM mags as they dont secure the rounds properly and they tend to pop out the top. My Sig 1911 mags do the same thing, these 100% solved the problem. If you own a Sig 1911, or any .45 1911, look no further. This is the pinnacle of 1911 Mags, my ETM+P mags function the same as well, so this review applies to both really. I use this magazine in my concealed carry handgun, and have never had a problem with it; literally. I clean my mags and check them for function regularly, and have never had a problem. I especially like the larger broader base pad. It makes it easier to draw the magazine out from a holster or the pistol, especially if I am wearing gloves. 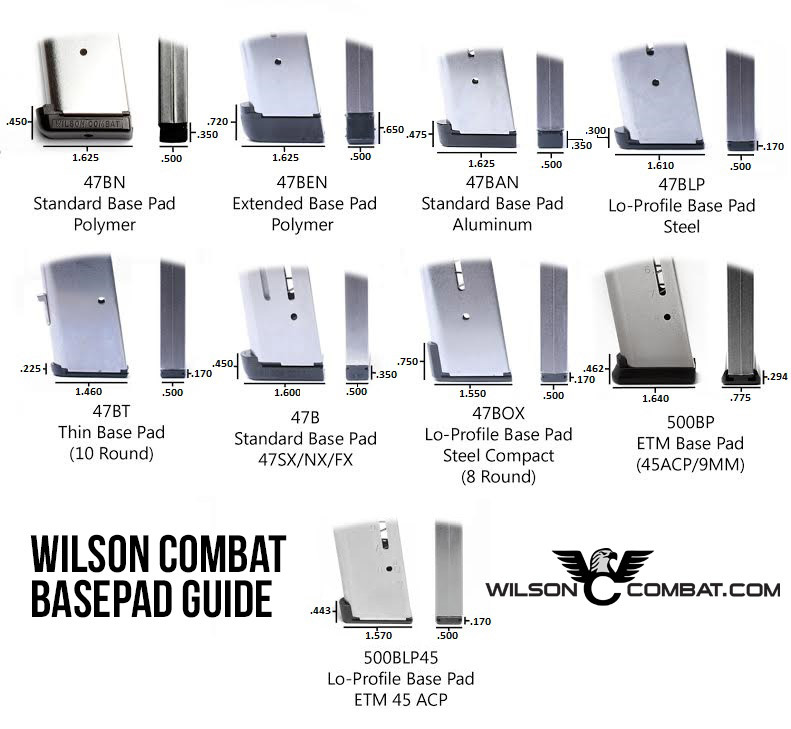 As a cosmetic thing, I like the largely printed Wilson Combat on the bottom of the pad. I would recommend this to anyone with a 1911, and it is the only mag I will buy anymore. One of my several 1911 pistol which is only a few months old, 45 ACP SIG NIGHTMARE was having feeding problems. I changed to a Wilson Combat Mag, problem solved never another malfunction. I use Wilson Combat Mags in all my 1911 pistols, its the only way to go for sure. Bought this clip on the advise of a buddy who owns a gun shop and has shot 1911s both for fun and in competition. Was a little concerned about the price but once I used it in my Kimber Pro Carry II HD I see why he recommended it. No failures to feed or lock backs when empty versus the stock clip. Love your product. These are the best 1911 magazines in the market, and the only magazines I use for my 3 Sigs! Short and sweet, these are simply the best. Right up there with the 47D I also ordered. Exceptional quality, flawless fit, drops free with ease. Excellent! Excellent quality drop free mags, I tested both 47d and 500 ETM mags in freezing cold Michigan weather and both ran perfect. Great fit and finish. I ordered 3 more of these after recently purchasing one to try over the 47Ds. Excellent magazine, no fit or function issues in any government or commander frames ranging from RIA to Colt. They are a bit long for CC, the only reason for a 4 vs. 5 star on my side. Just received two Elite Tactical magazines, couldnt pass on the sale price for my Sig XO. I am slowly replacing all my other magazines with Wilson Combat magazines when I have the spare money to do it, two at a time until I replace all the other non Wilson magazines. For me the Wilson Combat is the best out there and I want only the best and place my trust in their product and I know I cant go wrong. My Kimber and I absolutely love Wilson Combat ETMs! Hands down the finest magazines for the 1911. Awesome looks, feel, and most importantly performance. I have a number of different 1911s and they all function the best with the ETM Mags. Even if you have a less expensive gun, these mags will make it work better. Worth every penny! I just ordered 3 of these, took them out of the package and I could immediately feel the difference between my old Kimber Pro-Tac Mags. I will be ordering more! Ive tried all types of mags and the ETM is the best there is. You cant beat these magazines any where!!!! Do you want the best magazines? This is it. threw away all my factory mags on all my guns and replaced them with these...huge, huge difference..solves loading issuses, jamming issues and all feeding issues on all my guns kimber, s&w, sig, all others all wilson parts are excellent and are well worth the $$$$!!! Ordered 3 for my S&Ws because of the excellent reviews. Definitely was not disappointed. No problems with performance, price was fair, service was good. Just took delivery on another 3. Totally satisfied. Wish I had access to Wilson 1911s. Will continue to be a Wilson customer. You can have a 1911 magazine and then you can have a Wilson 1911 ETM. I use my 1911 for carry and this is that I use to feed my 1911. When your life is on the line this is what I trust. These mags are great. They run with ease and are of high quality. I would gladly recommend to anyone without any reservation. They are by far the best magazines I own. These magazines run great. They feed all 8 rounds reliably and have never failed me running them through my Guncrafter American 1911. If youre having reliability/feeding issues with your 1911, poor magazines are typically the culprit. Pick up some Wilsons and dont look back. I purchased some of these 1911 Elite Tactical Magazines in my search for a reliable multi-weapon 1911 mag. These perform exceptionally well. They feed reliably, eject smoothly, and are all around THE magazine for the 1911 platform. Con: More expensive than USGI and factory magazines. Pro: Worth every penny. This is the magazine Browning meant to build for the 1911. I would will definitely buy them again! I bought 6 of these and ran 80 rounds through them using my Kimber Pro Carry 2 at the range and they were perfect, not one issue, Great Magazine! I bought one of these mags from Dillon Precision with my last order. This was my first Wilson mag and it has quickly become my favorite mag. Altough I have also 2 Wilson 47D mags - the 47D is a excellent mag, the ETM is my favorite with its slightly larger basepad. I rely on the ETM when I carry concealed because I know it wont let me down! Just received the magazines, they look great, shipping was fast and they were packed very well. I have tested the 1911 Elite Tactical Magazines while training and instructing in the Mojave desert at Front Sight, Nevada. Never experienced a failure of any sort while using a wide variety of .45 ACP ammunition types. These are my Go-To magazines! I use these mags for IDPA and USPSA. They load easy and Ive never had a malfunction yet. I dont think you could get anything better for competition or service use. Feeds everything, in every 1911 I own, right out of the package. Picked up a RIA for a truck gun. Kimber,KimPro Tac Mag, with a HP seated 1.230, smashed low into feed ramp, and set bullet to 1.110. The 500 - smooth and flawless. May be better than the 47D. Ordering 4 more. Thanks Wilson. Some products will improve your weapon and some will save your life. This product will do both. As a customer and former law enforcement officer; it is my opinion that their is none better. Wilson Combat reputation for quality and performance is for a reason. You can exspect a perfect fit in your 1911; to feed ammo that other magazines will not and to eject smoothly with extended loaded capability. They simply work when you depend on them the most. Bottom line. With this Wilson Elite Tactical Magazine in my weapon verses an assailant without; they would be at a deadly disadvantage. Isnt that what its all about? Just the best and most dependable!! I have tried them all and WCs mags are the best I have ever used. Plus they are still priced very fairly. After purchasing 3 of the ETM Magazines and running every round of .45 acp imaginable through them, I had the treat of a lifetime. All 3 Mags were used in two different guns, a new 1911 as well as a 1970s Clark Custom...THERE WERE NO PROBLEMS PERIOD with these magazines. 5-Stars to Bill Wilson and his Crew for a Outstanding Magazine design! I purchased 12 of these mags for my Kimber and Les Baer and have never had a single problem. I did not fire the Kimber before I had the Wilsons Mags. Great product.We all need more! These are the best magazines you can own. These 3 make a total of 18! A must for any 1911 owner. I bought 2 of these mags to replace the factory mag for my Kimber Stainless Pro TLE II. So much easier to load, no hangups when firing, fit perfectly without alteration. Definitely worth every penny for these mags. The cure for any 1911s feeding problems! Anyone who has ever experienced a failure to feed from their stock 8-round 1911 magazines should immediately purchase as many of these Wilson Combat ETM magazines as they can afford. These magazines are OUTSTANDING and give me a whole new appreciation for my Smith & Wesson SW1911 Pro. My 1911 originally came with two Check-Mate 8-round magazines and to keep in line with the pistol vendor, I ordered two more which performed similarly. In parallel, Ive been on a quest to see which rounds my seemingly finicky 1911 liked. Ive stayed away from several reputable brands of ammo because they wouldnt reliably feed the 1st round from a fully loaded stock magazine. Enter the beautifully designed Wilson Combat ETM magazines. After loading eight rounds, I immediately knew I was in for a treat when pressing -- not slamming -- the full magazine into the pistol. It seems that, in addition to attention to quality, Wilson Combat has given their 8-round magazine a little more breathing room to allow less cartridge-to-cartridge pressure for picking off that first round in a full magazine. I plan on ordering several more of these magazines and putting my stock/Check-Mate mags up for sale. You cant fully appreciate the difference between stock mags and these Wilson Combat ETM mags without trying them yourself. These mags are amazing! You can tell the walls are thicker then any other 1911 mag. They are smooth feeding and the best part is you can trust you life with these mags! You can tell the time and craftmanship that go into each mag they always drop free, always feed smoothly, and tough as nails I bought one at my local sporting goods store went to the range and came back and bought four more mags I would give them 100 stars if they let me. You will not find a better mag for a 1911 period! I only use the 8-round ETMs in my Springfield TRP. Never any problems. Great, great magaizes. My wife and I just finished a week at Gunsite, my second trip with Wilson Mags. I shot my Classic Supergrade while my wife short her Tactical Elite, both in 45 ACP. One thing about Gunsite, this is a combat school and your Mags will be dropped repeatedly into the Arizona desert sand both full and empty as you speed load numerous times each day. The ETMs take the abuse preform flawlessly. Needless to say you clean your equipment each evening before the next days shoot and here too the ETMs shine as they are easy to clean and reassemble. A neat feature I like is the small notch in the area of the mag catch slot. This innovative feature makes administrative mag changes while holstered a breeze - no more one handed struggle. I also appreciate the numbering system on the base pad to keep track of individual mags and the various replacement base pad options available. If like me you are a fan of the venerable W.C. 47d you will not be disappointed in this upgrade. With all the reviews it is virtually impossible to add anything new but for years I relied on the 47D without even one problem, such as feeding etc, but I was introduced to the EMT via a phone discussion with John Lahue and the one EMT that came with my new CQB Elite. Indeed it overshadows the 47, not by much but certainly enough to make a difference i.e. smoother spring for cartridge loading, cartridge numbers for Tacktical reloading, etc. Abolutely the top of the table.Great to see you dont rest your laurels on that which you have had for some time that has already proven itself. I had a Ruger sr1911 jamming on the last round almost constantlty, and a sig scorpion carry the would not feed at all. As a last ditch effort I ordered a couple of your ETMs. Both guns now feed perfectly. I have not had one failure. If I had known your quality was this good, I would have bought the guns from you and saved myself a ton of headaches. I have been using Wilson mags for a while now. The last 5 mags that I have bought have been Wilson Elite Tactical Mags. They run flawlessly and are nicely marked with on the side with the number of rounds in your mag. They feed flawlessly which is absolutely imperative for a 1911 whether it be competition or for concealed carry. Thank you WC for making excellent, high-end products! You are making customers for life. Awesome as all Wilson Products are. Best 1911 mag on the market! I have continually had problems with Sig and Kimber mags but when I switch to these Wilson Mags, the problems seem to go away immediately. A day at the range with no 1911 magaizine issues; Priceless!! They fixed all the issues my 1911 had. Just buy them, you wont regret it. The absolute best magazines money can buy. I brought a sig 1911 and it came with two magazines. However, I was more often than not getting a FTF on the first round with the standard Mags. Order WC ETM Mags and I have not had any FTFs while preforming function checks of the ETM Mags with my ammo. Extremely happy with the ETM Mags and if you have a 1911 you should have WC Mags running through it. Worth the money!! I now have two of these magazines and love them. I use them in both my Remington and Kimber 1911 and have never had a problem. They are much stronger than any of the mags that came with either gun. I have dropped them multiple times and even stepped on one and they both still work flawlessly. I would suggest these to anyone! These came with my new CQB Elite, and after using them I ended up buying them for every full-size 1911 I have. These mags like the Wilson guns themselves are leaps and bounds above everything else. When only the best will do, the ETM magazine is the perfect choice. I run these mags exclusively in all my full size 1911s. I had one gun in particular that was having issues with feeding, and I switched to these mags and my feeding issues disappeared. In this economy, everyone may not be able to afford a full custom 1911, but what you can do is unlock the full potential of your gun by utilizing superior parts from wilson combat. These ETM mags are easy to load, solid and reliable function, slick finish, and look good! The ETM is the perfect magazine; they load easy, insert easy when in full battery, always drop free, never fail to lock back on the last round, and they run flawlessly in all my guns. I have 8 1911s of various different manufacturers, and the ETM magazines run 100% in them all. Wilson Combat mags are all that I will run anymore; either the ETMs, or 47Ds. I have 7 ETMs, and 5 47Ds you can never have too many. I recommend them to everybody that asks about magazines as they are simply the best. I think a lot of people skimp when it comes to magazines in the 1911 platform and then complain when it is not reliable; if they would just get Wilsons they would see just how great the 1911 can be. picked up a pair of these the other day. high quality stuff. Hello Sir, I just got the 3 500s that Ive purchased here. Im located here in the Philippines. Awesome stuff! thank you! I recently bought a Kimber Custom II and have been using the factory 7 rd. mag, KimPro 8 rd., and Wilson Elite Tactical 8 rd. Between the three I have put 600+ rounds through the gun and have experienced no failures of any kind with the ETM. Excellent cycling and last shot hold back, zero problems. The other magazines have been almost perfect, but the ETM has been 100% flawless. Even after accidentally dropping the mag in the sand while shooting at the gravel pit the magazine continued to run 100%. I would recommend this to any 1911 shooter. Excellent magazine, works really great on my Loaded 1911-A1 without any malfunction at all. this is what I use on my daily concealed carry weapon. dependable and reliable.. I trust my life with this magazine. I highly recommend this. I have run Wilson 47D magazines in my various 1911s over the last few years. I have never had a problem with any of the eight I own. The only minor complaint I had was that there was a little bit of resistance when inserting a full magazine when the slide was in battery. This was a small issue and only resulted in me developing the habit to slam the magazine in place a little harder when reloading. Approximately one month ago I purchased two Wilson Combat ETM Magazines. My initial impression was that these were very nice in the fit and finish department. The mag body is well constructed with no burs or rough spots. The base pad is easily removed and appear very durable. There was no noticeable wear after taking the base pad on and off. The follower slides smoothly within the magazine body. My next test was to load it with non firing training rounds .45 ACP. The rounds loaded easily and there was more noticeable give in the top round when the magazine was fully loaded. I racked the dummy rounds through a Springfield TRP and the rounds fed flawlessly. I practiced speed reloads in dry fire and the mags were noticeably easier to insert when the slide was in battery than the 47Ds. Next up was to take them to the range. I fired approximately 300 rounds through the two magazines. I used a Springfield TRP and a Kimber Custom II. I had no issues at all. The rounds fed smoothly and reliably. My reloads were noticeably faster now that I do not have to slam the full magazine when the firearm is in battery. I will fire at least another 300 rounds through these magazines over the next week. If they continue to be reliable, which I have no reason to think they will not, I will use these as my carry magazines when my Wilson Combat CQB arrives. Bought the 500 ETM at a LGS on the advice of the tech. He was right on target. This product does exactly what its supposed to. Flawless from day one! Thanks for making such a great magazine. I was really excited when I got this magazine! I thought the mag my 1911 came with was great until comparing it with this one. i love how light yet sturdy it feels. it doesnt let the round rattle either like my old ones. I am having a little trouble loading it into my gun when the slide is closed, but the papers that came with it told me exactly how to fix it! thank you wilson combat! After experiencing the 47d magazines, I doubted 1911 mags could get any better. However, with the ETMs you get a more solid base pad for both protection upon drops and grip purchase for mag changes. Also, it seems that the spring and follower design are enhanced to ease loading a fully loaded magazine into a +1 chamber. An added bonus is the fuller base pad being easier to seat under stress into a 1911 with a magwell. All around a superior magazine and more than enough to trust your life with. The construction is perfect, as is its operation. I carry this in the Kimber, and two 10-round Wilson Combat magazines in a separate holster. LOVE the followers - they simply inspire confidence. All of these magazines work perfectly every time. I entrust my life on these magazines but definitely cannot say the same about the other manufacturers 1911 magazines. Used 4 of these magazines to fire 800 rounds over a course of a 4 day pistol training course. Not a single malfunction. Magazines were cleanly ejecting from the firearm. One of the most useful features was having numbers on the bottom of the magazine to mark. This allowed me to keep track of my magazines. Some of the magazines were required to be dropped on the floor. I designated 2 magazines for this task and did not have to start destroying all 4. I have several of these magazines, they operate flawlessly. They are truly an 8 round mag, and there is an unmistakable difference when comparing them to someone elses modified 7 round mag. I have kept several of them loaded now for a couple years and the springs still function perfectly to the last round without problems. Undoubtedly the best 1911 magazines Ive ever used. I have owned almost every brand of 1911 magazine made. I bought the ETM to see if it was as good as I heard it was. This is the best magazine made. It inserts easily with the slide closed. Reloads during competition are flawless due to the ease with which the magazine seats. It drops when the magazine release is pushed. My gun runs flawlessly with this magazine. It is very easy to disassemble and put back together. I now own 10 of these works of art. Nice to finally find a true 8-round .45 mag instead of hybridized 7-rounders. Ive been giving three ETMs a hard workout. They are as smooth as the day I bought them. Thanks for an innovative product! Dont even need to say much here. The ETM is by a wide margin the best 1911 magazine on the market today. Tough as nails and feeds 100% of the time. I use them on all my .45s and wont go back. Even my Colt and Kimber mags have Wilson followers and springs. To MR. Wilson, just wanted to let you know that i received the 2 500 45 mags you sent. i was very happy with them. much better than the 47d mags i have.the difference is like day and night. i am also glad to see you truly care enough about your customers to read their complaints. so i just wanted to thank you for carring./ thats what makes a bussiness reputable. and as soon as i can sell the 3 47 d mags, i will be ordering more of the 500 etm mags and then some. i have always ordered from your company for years. and will continue to do so in the future. i tell all my friends about your products and customer service. anyway once again, thank you so much for caring./ thats what makes a company unique.